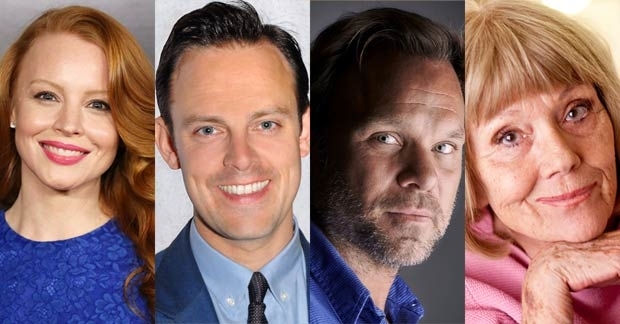 Lincoln Center Theater (under the direction of André Bishop) has announced that Lauren Ambrose will be Eliza Doolittle, Harry Hadden-Paton will be Henry Higgins, Norbert Leo Butz will be Alfred P. Doolittle, and Diana Rigg will be Mrs. Higgins in its upcoming production of Lerner & Loewe’s My Fair Lady, directed by Bartlett Sher. Produced in association with Nederlander Presentations Inc., the classic musical, with book and lyrics by Alan Jay Lerner and music by Frederick Loewe, will feature choreography by Christopher Gattelli and music direction by Ted Sperling, and will begin previews Thursday, March 15 at the Vivian Beaumont Theater (150 West 65 Street). Opening night is Thursday, April 19. My Fair Lady premiered on Broadway on March 15, 1956. The legendary original production won 6 Tony Awards including Best Musical and ran for 2,717 performances making it, at the time, the longest-running musical in Broadway history. Lincoln Center Theater’s production of Lerner & Loewe’s My Fair Lady will have sets by Michael Yeargan, costumes by Catherine Zuber, lighting by Donald Holder, and sound by Marc Salzberg. Additional casting and creative credits will be announced at a later date. Harry Hadden-Paton and Diana Rigg are appearing with the support of Actors’ Equity Association. Harry Hadden-Paton (Henry Higgins) will be making his New York stage debut in Lerner & Loewe’s My Fair Lady. His UK theater credits include in the West End: The Importance of Being Earnest (Ian Charleson Award nomination), Flare Path, and The Pride. Off-West End: She Stoops to Conquer (The Royal National Theatre), Posh (The Royal Court), The Changeling (The Young Vic), and The Prince of Homburg (The Donmar Warehouse). Known to U.S. television audiences for his portrayals of Bertie Pelham on “Downton Abbey” and Martin Charteris on “The Crown,” his other TV credits include “Versailles,” “Wallander,”and “Grantchester.” Film: The Little Stranger, About Time, The Hollow Crown, The Deep Blue Sea, In the Loop, and La Vie en Rose. Diana Rigg (Mrs. Higgins) Broadway: Medea (Tony Award), The Misanthrope (Tony and Drama Desk nominations), Abelard and Heloise (Tony nomination). Off-Broadway: Britannicus and Phaedra (BAM). National tour: Colette, King Lear. Her many London theater credits include West End: Pygmalion (Mrs. Higgins, 2011/Eliza Doolittle, 1974), Honour, Suddenly, Last Summer, Follies, Heartbreak House, Night and Day, Macbeth, Abelard and Heloise; National Theatre: Humble Boy, Mother Courage and her Children, The Misanthrope, Jumpers; Almeida Theatre: Britannicus, Who’s Afraid of Virginia Woolf, Medea, Phaedra; RSC: Twelfth Night, King Lear. Film: Breathe, The Honourable Rebel, The Painted Veil, Heidi, Parting Shots, A Good Man in Africa, Snow White, Evil Under the Sun, The Great Muppet Caper, A Little Night Music, Theatre of Blood, On Her Majesty’s Secret Service, The Assassination Bureau, A Midsummer Night’s Dream. Extensive TV credits include PBS Masterpiece’s “Victoria” (currently as Duchess of Buccleuch), “Game of Thrones” (3 Emmy nominations), “Extras,” “Victoria & Albert” (Emmy nomination), “The Mrs. Bradley Mysteries,” “Rebecca” (Emmy Award), “Screen Two” (Cable Ace Award), “Mother Love” (BAFTA Award), “Bleak House,” “Diana,” “The Avengers.” She was named a Commander of the British Empire in 1988 and a Dame of the British Empire in 2004.